​From any of the freeways (I-96, I-94, MI-10, or I-75/375, get to Jefferson Avenue East. 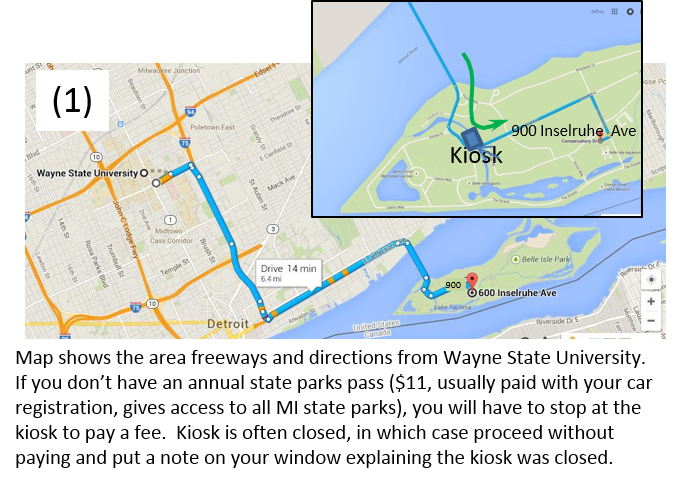 About 2 miles from downtown Detroit, go right (it’s labeled Grand Blvd) , onto the ramp to the bridge to Belle Isle Park. On the island go slight right, then left on Central Avenue [green arrow]). Turn right at the equestrian statue (Inselruhe Ave). The Aquarium parking lot is at google maps location 900 Inselruhe Avenue. A. The Detroit Boat Club has about 45,000 square feet, half of which is used by the Detroit Rowing Club (not shown). C. The Dossin Great Lakes Museum is a 16,000-square-foot maritime museum that features Detroit's role in maritime history. ​D. The Belle Isle Aquarium, has 10,000 square feet of gallery space with an arched ceiling covered in green glass tile to evoke an underwater feeling. The Aquarium has a unique collection of gars, electric eels, freshwater sting rays, invasive species exhibits, etc. Its research facility is in partnership with Wayne State University. 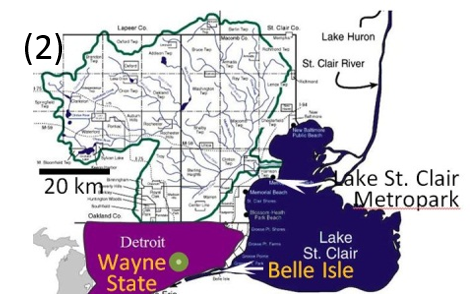 ​Creation of the above page of educational resources was funded in part by the Michigan Invasive Species Grant Program through the Departments of Natural Resources, Environmental Quality, and Agricultural and Rural Development. ​This material is also based upon work supported by the National Science Foundation under Grant No. 1614187.